There are many activities at which Golden Retrievers excel. The one all Golden owners will almost automatically reap benefits from is happy hugs and wiggles from the four-legged hugster. Even more benefits are to be had, however, if you and your Golden participate in any of the following types of activities. You and your dog will develop a stronger bond, you both will benefit from healthy exercise and great socialization, and your dog’s innate desire to work will be satisfied. All around winning situations, whether you actually “win” or not! Agility competition has skyrocketed to the top of many dog lovers’ list of favorite activities in recent years. There’s a good reason for this. Agility training and competitions are fun! MeMe goes flying . . . Thanks again to Merry Shelburne for this wonderful photo! You and your dog will learn to run courses that include hurdles to jump, weaves to be woven, and teeter-tots to be mastered. And all the while, your dog will be following your signals and cues, performing for you and the crowd, and generally having a grand old time! To the extent there is any competition, your dog’s primary competitor is him or herself since the primary goal is trying to improve the time it takes the dog to run the course (which is always changing). Best of all, this builds a solid rapport between you and your dog, since your dog learns the importance of watching your movements and cues to help the course. Seriously, what’s not to love about this? 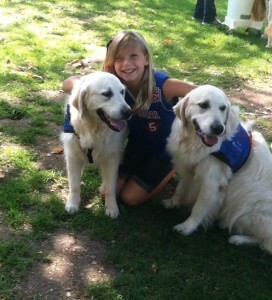 I had two littermates, Alex and Rex, who both worked as certified Therapy dogs. They visited regularly at Kaiser Permanente and other facilities, including senior citizen centers and hospice facilities. Doing so, they consistently would demonstrate the calm, loving, and attentive nature that is the hallmark of the Golden Retriever. Rex and Alex sporting their working vests! I was constantly amazed by how readily they would know, walking into a patient’s room for the first time, whether to strike an upbeat, tail-all-a-wagging mood, or whether it would be more appropriate to go slowly to their host and quietly put their head down in his or her lap. It would never fail: they just knew what tone to strike. It was extraordinarily rewarding to be able to share them with so many in this way. When a patient is hospitalized, or perhaps an individual is near the end of his or her days, a warm nuzzle from a furry friend may well be the bright spot of the whole day. And to be able to look into those warm melting eyes and see love radiate back, it may even be the most affection that person has seen in days or more. It was an honor to be able to watch them do such work. A recent addition to the range of ways one can training and work with a Golden, nose work teaches the dog and handler to work as a team, identifying various scents and locating them upon request. This is ground work for training a dog to do search and rescue work, but it is also another great bonding experience for the dog and owner. 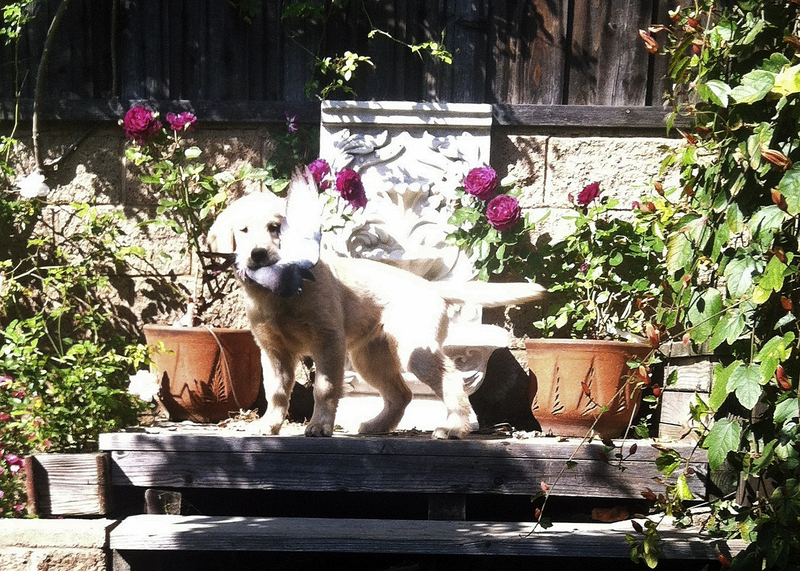 Here is a video clip of a young SamBen pup performing a search in an outdoor area. This pup was too young to compete formally at the time of this video, but if he had been eligible he performed so rapidly that he would have qualified. And he loves learning and working with his very talented and devoted owner in this way! There are various groups that organize “dock diving” events. These are fun-filled days, organized around large portable swimming pools that dogs and their handlers get to enjoy when the handler tosses a bumper into the pool and the dog goes after to retrieve it! The jumps are amazing, the dogs love the water, and it is all around great fun! Fully consistent with Goldens’ strong desire to please their owner, Golden Retrievers consistently rank tops in national obedience trials. For example, at the AKC 2011 National Obedience Invitational, open to all qualifying dogs of whatever breed, Goldens took nine (9) of the top ten (10) places! These dogs are ready to learn, want to learn, and will fare best with a loving owner who provides steady clear guidance. Even if you never enter an obedience competition, how nice to have this as part of your dog’s natural personality! People affectionately refer to these dogs as “Goldens” and that is an apt shorthand way to refer to these wonderful dogs. However, the second part of the name, equal in importance, is “Retriever.” These dogs were bred for, and have a deeply rooted instinct for, field work. To fully appreciate this, you need only once to see a Golden in the field go attentively rigid as he takes his mark on a bird (or bumper) and then him hold his steady gaze on the mark as he goes through underbrush, through water, and other challenging terrain to reach the mark, and finally the look of complete contentment as he happily trots back to his handler with his mark safely in his soft-mouth and places the bird in his handler’s hand. To see this is to know and fully understand a Golden’s true natural temperament. I believe that to be good stewards of this breed, we have a collective responsibility to nurture, maintain, and respect this equally important component of the breed’s instincts. Toward this end, I work my dogs in field work as well as the other venues mentioned here. For example, here is Alex showing MeMe how to do a water retrieve. And here is young Kate, as happy as can be, with one of her first birds! Kate with her first pigeon! It’s official, she’s a natural! Here are some links to explain what the various titles are that you may see in a dog’s registered name. Some titles precede the dog’s registered name and others follow the name. The first two links are for titles awarded by the American Kennel Club (AKC). These titles may be won by a dog of any breed. 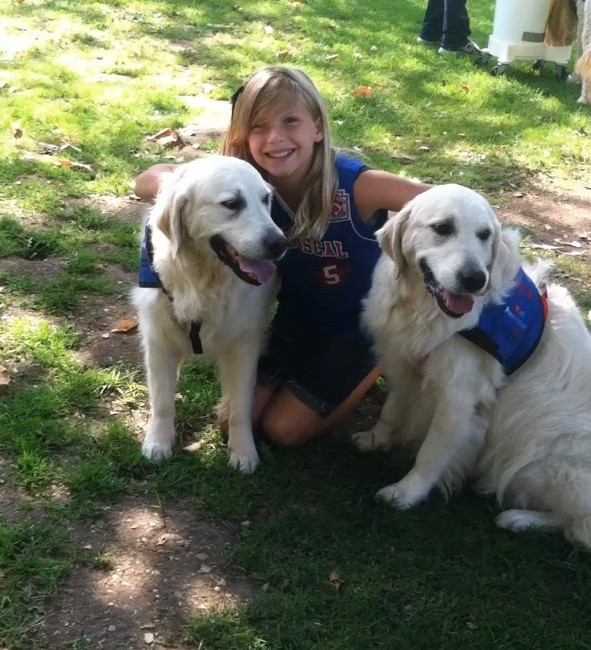 The third link is to titles awarded by the Golden Retriever Club of America (GRCA). As such, they are titles awarded only to qualifying Golden Retrievers.